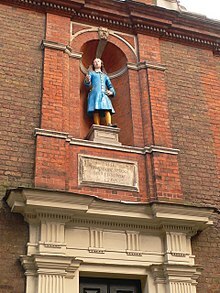 The school was founded in Duck Lane in about 1688 by voluntary subscription as a charity school for the education of poor boys to teach them reading, writing, religion, and trades. It moved to purpose-built premises in Caxton Street. From 1714 to about 1876, it also admitted girls. In 1899, it was agreed that the school should move to a site that had been owned by the Christ Church National Schools Trust, and the Caxton Street site was then used for an elementary school. The school closed in 1926. During World War II, the building was used by the American services as a store. Afterwards, the Girl Guides used it as a youth club. When the National Trust bought it in 1954, it was used as their membership and head office. Later, it was converted into a gift shop. June 2014 saw the opening of renowned British designer Ian Stuart’s exclusive boutique in the building. ^ Cox, Montague H. (1926). "Blue Coat School". Survey of London: volume 10: St. Margaret, Westminster, part I: Queen Anne’s Gate area (1926), pp. 144-147. British History Online. Retrieved 21 April 2011. ^ a b Provençal, Nina (February 2011). "Business of the Month: January and February 2011 - The National Trust Shop". Business of the Month. Victoria Business Improvement District. Retrieved 21 April 2011. ^ Tye, Timothy. "Blewcoat School, London". Historical Buildings in London. Timothy Tye. Retrieved 21 April 2011.